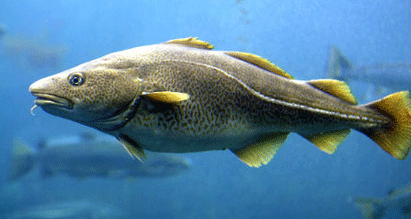 Cod is a migratory fish of the deep that likes cold water. It comes to the surface in the winter months and goes towards the coast to deposit its eggs, presenting a fishing opportunity for fishermen in fishing boats who catch the fish for production of various end products, such as Stockfish (Dried Codfish), Salted Codfish, fresh Cod Fillets, etc. Members of the Cod family include Cod, Sey, Tusk, Haddock, and Ling, but Laruche Imports Inc. specializes in the importation of the premium quality grade of Norwegian Round Cod. The drying process for stockfish takes approximately three (3) months. 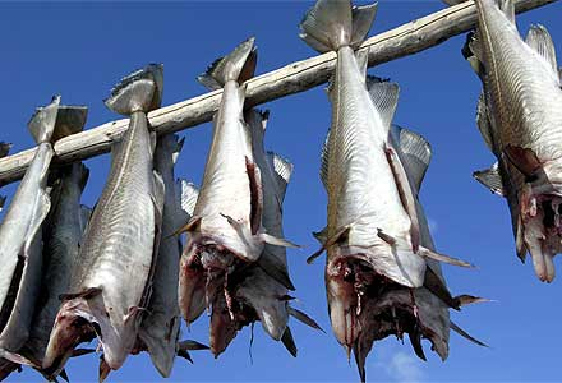 First, the head and guts are removed and the fish is tied together at the tail, in pairs, and hung on wooden racks or lofts to dry in the open fresh cold air. 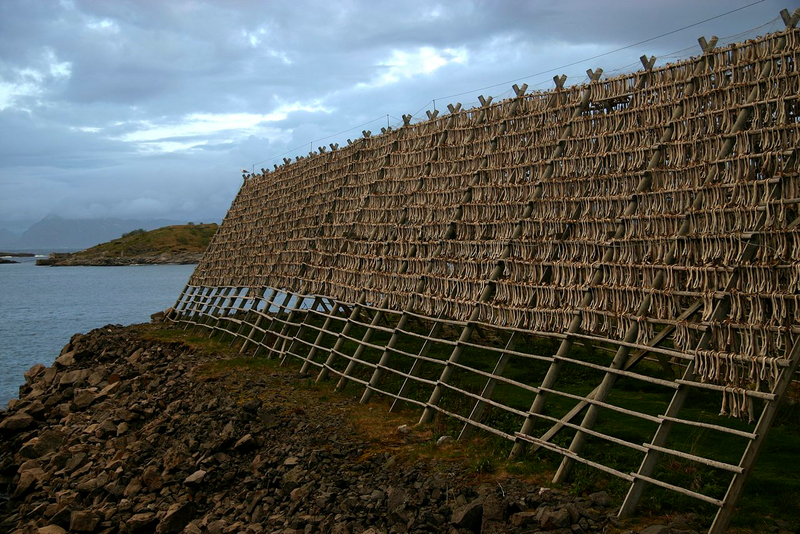 Typically, the drying process begins in early March, and most Codfish drying takes place in Lofoten and Finnmark, Norway where the winter temperatures and environmental factors are conducive for producing the best quality Stockfish. It is at precisely the time of year when climatic conditions in Northern Norway are perfect for drying fish that the cod comes into the coast to spawn or feed. The pure air and the cold winter climate from January to April are ideal components in this unique process – without doubt the oldest method of fish preservation and the least energy consuming in the world. In the drying process about 70% to 85% of the water in the fish is removed and all that are good and nutritious are retained in its most natural form. The result is a fish concentrate, healthy, fresh and chemically free of any artificial additives. The nutritional value of one kilogram of Stockfish is the same as approximately five kilograms of fresh fish. Water loss accounts for the difference while all the nutrients are retained. 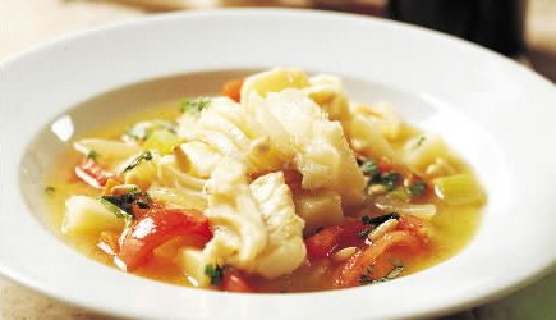 Stockfish is one of the richest known sources of protein, essential B-vitamins, calcium, iron and Omega 3 fatty acids. 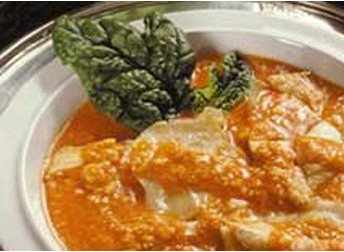 No other high protein food product can boast of similar properties. Nothing in the Cod is wasted. The heads are dried and sold separately. The roe and the liver are either sold fresh or canned and Cod tongues are sold to markets where they are considered a delicacy. Cod liver oil and Cod Roe are commercial by-products of Cod fish. Norwegian Stockfish is world famous for its quality. Premium quality stockfish requires the right balance of weather and temperature. The air must not be too dry and the temperature must be low enough to avoid flies and maggots but warm enough to avoid freezing. Add a continuous breath of wind, with a touch of seaborne salinity for best results. These ideal drying conditions are found in Lofoten and Finmarken Norway between January and April which coincidentally is the time of the year when the Codfish comes to the coast to spawn. Then it is further sorted into a variety of grades based on quality, thickness and length. There are at least 12 different grades of “first class’ Lofoten cod, 5 of “second class” cod, and African quality. Stockfish can be kept for many years if stored in a cool dry place, however, humidity can cause its deterioration. When immersed in water it soaks up all the moisture again and the flesh becomes milky. Many cultures soak it in water for 5 or 6 days replacing the water each day before use. The fish can then be cooked in the same way as fresh fish: steamed, fried, creamed or grilled or used in a variety of nutritional and tasty dishes. Stockfish is exported from Norway to over 30 countries including Italy, Sweden, Germany, UK, France, Spain, USA, Nigeria, Cameroon, etc. Norway has been exporting stockfish for over 1000 years. The ease of preserving and transporting stockfish made it the perfect food item and trading commodity for the Vikings as they embark on long voyages between the 8th and 11th centuries. Along with furs and skins, it became one of the oldest trading commodities for the Vikings. When the Vikings era ended, merchants from Europe and Northern Norway traded wine, fabrics, and grain for fish, skin and furs at Bergen. The Hansas dominated this trade and guaranteed regular sales of stockfish and cod liver oil from Northern Norway. These dependable sales made it possible for people to remain in the fishing villages along the Northern coast and perfect the craft of producing stockfish. Consequently, the populations of Lofoten, Vesteralen, and Finmark increased rapidly. By 1550s Bergen and Trondheim had monopolized all foreign trade to and from Northern Norway. The Northerners were under contract to deal only with their creditors in these towns. Stockfish accounted for almost all of the Norwegian fish exports up until the mid 17th century when Klipfish became a competitor. 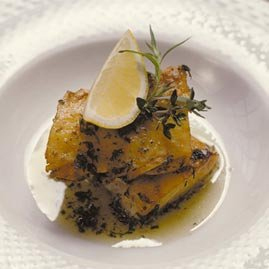 Italian markets, however, remained loyal to stockfish. In the 1830s things began to change. Bergen creditors began to lose their monopoly as the Lofoten merchants, empowered by cash reserves built over the years, gradually replaced them as suppliers and creditors to the fishermen. Today Norwegian stockfish is the most superior quality stockfish in the world with an increasingly global market as over 60 countries depend on it for nutrition and taste.